Christmas and the changing of the new year are well behind, and the new year ahead. Here in Goa, where Hindus, Muslims and Christians live in peace as neighbours, the Christians, Catholics, celebrate the Christmas on 25.12. That means only for one day. 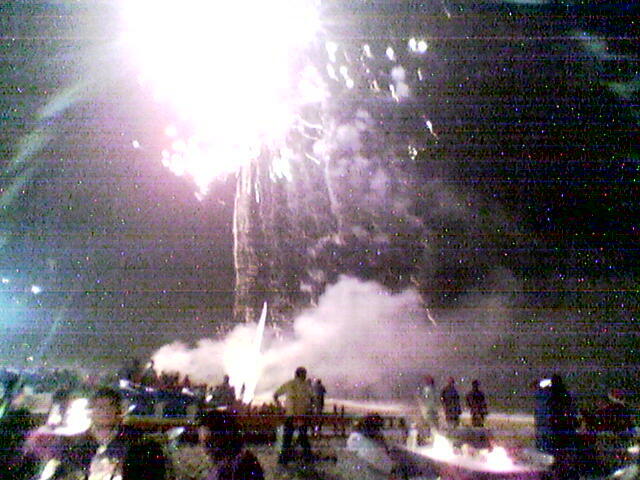 And the celebration started with wonderful fireworks on the beach at midnight, when the Christmas Eve turned to Christmas Day. The beach was full of partying tourists, and in Baga they were mostly Indian. During the days between Christmas and New Year, the local police was numerously employed in directing the traffic, ’cause the streets and roads were so full, especially in the evening and night time. I’m sure many unlucky people had to change their new year on the road in a stopped line of motorvehicles. A four-wheeler seemed really helpless in that traffic chaos, when with a two-wheeler you were able to zigzag relatively fast through all the traffic jams, if you had a skillful driver. And so it was then, that I was well in time on Baga beach before the year changed and the place was swarming with people and the atmosphere was joyos. Here in Goa the men really dare to dance and enjoy of it. When the year changed the fireworks were something I’ve never seen before. They were even more magnificent than in Christmas. Wherever you turned your head you saw splendid fireworks cracking, and this show lasted for half an hour. People weren’t saving money when doing this. The music was roaring, the sea was roaring and a stir ran through the crowd every once and a while. So the year changed happily in Goa and elsewhere in India. No bomb bigger than fireworks was blown. This I say, ’cause the fear of it might have narrowed down the amount of tourists this season. And maybe a small fear of it was hiding out also in my and some other people’s mind. This I say because when a young man, who had lost his friends, asked me to guard his big and heavy black bag for ten minutes, the time he’d look out for his friends, and I kindly agreed to do that, I was scolded by locals. I had to leave the possible bombbag there and go away. I thought it was a bit exaggerated, but I guess that in the end it’s better be safe than sorry. In Bamboo Forest, Anjuna, they’ve had a custom to arrange a three day party, and I went to see what’s happening there. On my way there the bike ran out of gas. Luckily it is always sold somewhere, in one litre bottles. The prize is one euro. But the Bamboo Forest was empty. The raves and parties alike seem to be very much stopped here by the authorities. The open-air-culture seems to be changing to a club-culture, since some new clubs have come. Well, since I was in Anjuna, I thought to go to Club Paradiso then, but inside there they said that the entrance fee was Rs 1500. I could have paid that prize in the New Year Eve early in the night, as all the food and drinks were included in the prize (that means only about 25e all night out), but not at two o’clock in the morning. So I went to Matrix (a club surrounded by water in Anjuna) and from there I came back to Baga, and ended up to one fully crowded restaurant by the street, where everyone spent the beginning of this year nicely until six o’clock, till the sunrise… And just on 4th of January the morninpaper Navhind Times informed us, that a Party Smart has been developed. That is a pill for party goers preventing hangovers resulting from alcohol.. Well well, I’ll report you on this miracle more, if I get this herby product in guestion in my hand. Previous It’s snowing in Goa also!